Although it’s been a few years, it seems like only yesterday that Harrison Ford last played that good guy of an uncertain age. We’re already well acquainted with him from The Fugitive and Air Force One: He’s lived such a true-blue life that he is surrounded by all of the things that make a man feel secure, namely his kids and gorgeous wife and home. But we can see it coming: Jack Stanfield, a Seattle bank’s head of security, is going to get some kind of comeuppance, whether he deserves it for having a character weakness, or for never having seen the dark side, for never having fully lived. And he does. In Firewall, Ford plays good-guy Jack Stanfield, who has for 20 years protected a bank that our villain, Bill Cox (played by Paul Bettany of Master and Commander fame), now badly wants to rob. Just when we start to wonder whether Jack is more devoted to his work than his family, we are quickly assured that he is a family man. (Does Ford have a clause in his contract that states, “I will only play honorable men. My character will do the right thing no matter what the cost”?) Once Harrison gets behind his family he will do anything to get them back. He’s even something of a hero at work. When Jack helps an underling find a way to deter and track a hacker, he sits down at the younger man’s terminal, writes a couple of lines of code, and leaves the guy dazzled in his wake, on his way into a meeting. His superiors in a bigger, badder bank about to merge with Jack’s little 27-branch operation, however, take issue with his Dudley Do-Right brand of risk management. Jack accuses the bigger bank’s leaders of preferring to allow some theft so it can pass the inflated costs along to the customers. “But we don’t want to do that, do we?” Jack snaps, stalking out the door. The bank robbers are clever enough to make his life and ours unpleasant, as they kidnap Jack’s family and demand that Jack steal $100 million from his bank and deposit it in their offshore accounts. If he doesn’t help him, they threaten to break his kid’s knees and worse. They make it look like he’s been gambling online and failing to pay his debts. They wire Jack with a camera and clone his phone so he can’t communicate that his family is being held hostage while he is being forced to rob the bank he’s worked 20 years to protect. So Jack gets his game face on and goes to work, his every move meant to save his family, but his every act of resistance causes the bad guy to up the ante. The film’s devices don’t drag the plot down. What looks like an identity theft case at the beginning is a smokescreen for something much worse. The thief has gathered more than Jack’s Social Security number; he has also compiled information about friends and colleagues — and about his son’s allergies. The title sequence suggests a sheet full of sensitive data reconstructed from a session through a shredder but this is only hinted at in the story. Jack suspects that some data leak within his company is more likely, but it’s not the first time he’s wrong about his assessment of the threats in his environment. But none of this is belabored. We see lots of gadgets and wires but it’s not about how the devices work, or about exactly how Ford is going to transfer of $100 million without setting off everyone’s alarms and whistles. The story is about how this ordinary family responds when tested by some people with malicious intent. His family is convincingly ordinary in a Hollywood way: The perfectly cast Virginia Madsen (finally, a wife who’s not implausibly May to Ford’s September) is the devoted and unfrazzled mother and successful architect who has designed their home. The kids are not exceptionally cute or brave or smart, nor are they wiseacre TV-sitcom kids; they’re just kids who are thrust with their family into a harrowing situation. In one scene between Paul Bettany and Jack’s son Andy, played by Jimmy Bennett, the bad guy is watching Flintstones cartoons and eating cookies, so little Jimmy wants to trust the man, even though the man had earlier threatened to kill him and his family. When Bettany turns on him he again shows everyone who is in control and demonstrates how little compassion he has for this family. This is the only reason this film works at all as the two solid hours of thriller it aspires to be. When we see that the family is just an stumbling block in the way of a fat cash prize, the bad guys start to look like they really will stop at nothing, and when the family unsuspectingly opens the door to the pizza guys and instead lets in 48 hours of hell, we sympathize. Watching Bettany manipulate Jack and his family is uncanny, like watching a lizard play excellent chess, not one move nor glance of an eye wasted. The film builds toward its crescendo, every few minutes bringing a new twist, an advantage for Jack, another smackdown from the bad-guy camp, two steps forward for the wife and kids and then another three back. The kids and wife get out to the car thanks to the wife’s knowledge of the crawl spaces under the house, but then the guys with guns are too quick and intercept them at the car before they can make their getaway. Yet while I could believe that Jack realizes he can track his family using the GPS unit in the family dog’s new collar, however, I couldn’t tell you why the bad guys would have thrown the dog in the van with the family in the first place – wouldn’t kidnaping a family be enough to deal with? Writers also have to beware of making their lead characters too smart: If Jack was such a brilliant programmer, wouldn’t he have simply programmed some “back door” for himself (and one that didn’t involve interrupting the lead guitarist at a Christian gospel service to borrow his cell phone)? Wouldn’t Jack trick his enemy before he robbed his own bank? Given the high number of Integrity points he’s collected to date, robbing his own bank to save his family seems about as unlikely as letting his family die. Harrison Ford is one of those actors about whom we women used to sigh and say, “I’d watch that man read the phone book.” And while he’s not reading the phone book here, his part is just about as predictable. 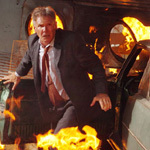 Ford gets to mutter and growl, but once he’s on his mission, he isn’t that interesting: He’s craggily handsome, energetic, and full of righteous fury, but he doesn’t have anywhere else to go for the entirety of the movie, except in a couple of humorously awkward physical scenes with his assistant. As Janet, Mary Lynn Rajskub represents another brilliant bit of casting: Capped in braided pink streaks and a sullen expression, she captures that corporate-drone-by-day/avant-garde-by-night persona that makes cities like Seattle go ‘round. Janet’s role also provides some slight but important comic relief through Firewall’s escalation toward its surprisingly (read: unnecessarily) explosive finale. Firewall kept me rooting for the family all the way to the bitter end not because of its technicalities, often the most compelling facet of a heist film, but because of its humanity. We see the rules between captors and their hostages evolve and change, which is what makes it compelling to the end. Bettany’s villain gives the story an irresistible center of gravity. While Ford is no more or less compelling than he’s been in the last five or ten of his action films, he still has the gravitas to believably redistribute some of the evil in this universe. In the universe of movie thrillers, Ford’s Average-Jack heroism helps us sleep well, believing that men like him will, when called upon, fight ferociously to protect all we value most.